A couple of years ago I started working with devices called dendrometers that measure changes in the diameter of tree trunks. They show minute changes during the day, as well as growth over periods of weeks and months. 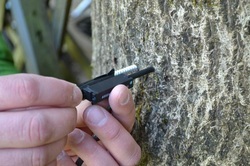 The SODA Logger 0.2 was used with a sensor to measure tree growth. Dendrometers are expensive so we made our own. Most dendrometers on the market cost $500 or more. While these units are great, they're too expensive to install the numbers needed to characterize the growth of a forest. We tested low-cost linear potentiometers with good success (even with the famous Pacific Northwest rain). Soil water content is important to understanding how plants and the environment interact. It's also useful to gardeners nad orchardists to decide when to water. The SODA Logger 0.1 was used to measure soil water content in a garden bed. It showed the decline in the summer that characteristic of the Pacific Northwest. The decline was punctuated by soil water recharge as the bed was watered.